The PML-1000 is an AC line powered LVDT/RVDT panel meter featuring multiple software functions. 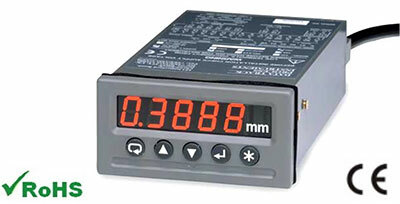 Ideal for industrial and test applications, it features a large, easy to read 5 digit variable brightness LED display. For control applications, it has an isolated 0-10 VDC, 0-20mA or 4-20mA scaleable output. A buffered, un-scaled, high speed 125Hz analog output is also available, for highly dynamic applications requiring the fastest response. An optional Serial (2 or 4 wire) RS422/485 communications interface is also available to allow connection to data loggers, PLCs and computers. With a user-selectable transducer excitation of 1 or 3 VRMS, and 2.5 or 10 kHz, the PML-1000 is compatible with all standard Measurement Specialties LVDTs and RVDTs.